Sept. 30, 2008 -- The Fine Arts Center Gallery at Arkansas State University presents “Monument and Memory,” an exhibition of recent work by Chicago p ainter and ASU alumnus Dan Addington. An opening reception honoring the artist will be held Tuesday, October 7, from 5-6:30 pm. The exhibition will run through Friday, October 31. Both the opening reception and the exhibition itself are free and open to the public. Addington has lived and worked in Chicago since 1993 after receiving a BA in Art and Theatre from Northwestern College in Orange City, IA; an MA in Art from Arkansas State University; and an MFA in Painting from Illinois State University in Bloomington/Normal. His work is based on his recent travels throughout Europe and has been shown in group and solo exhibitions across the United States. He is represented by Aliya/Linstrom Gallery in Atlanta, Malton Gallery in Cincinnati, and the Rymer Gallery in Nashville. In Chicago, his work has been shown in numerous venues, including the Chicago Cultural Center, Contemporary Art Workshop, and various university galleries and suburban fine art centers. He has served as guest lecturer and visiting artist at colleges across the Midwest, recently exhibiting work and conducting guest artist workshops at St. Cloud State University in Minnesota and Ball State University in Indiana. 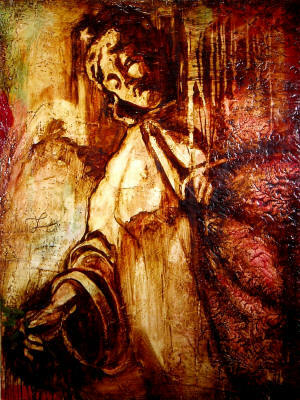 Addington is known for his work with wax and tar, and often lectures on encaustic painting, an ancient technique that involves molten beeswax. In addition to his role as practicing artist, Addington has worked as a gallery director at various venues since receiving his MFA. He became director and, later, partner at Gwenda Jay/Addington Gallery, Chicago, in the late 1990s, and became sole owner in 2007, changing the name to Addington Gallery. Addington has recently sat on panels and lectured about his work and other art-related topics at Loyola Museum of Art, the St. Louis Art Center, the Karitos National Conference on Art and Spirituality, and the Chicago Artists Coalition. He has recently served as juror for exhibitions at the St. Louis Art Center, Southeast Missouri State University, the City of Chicago Artist Assistance Grants Competition, and the Loyola National Works on Paper Competition. In a year full of professional changes, Addington recently became a father. Aedric Addington was born on February 21, 2008. In his free time, Dan plays guitar and sings in “Blind Anabaptist Blues,” a band that performs regularly in the Chicago area. The Fine Arts Center Gallery is open from 10 a.m.-5 p.m. Monday through Friday. For additional information, contact ASU’s Department of Art at (870) 972-3050. Dan Addington's "Veils of Morning"